With research into the effects of climate change rapidly advancing it is appropriate to reflect on both the achievements and future directions of this research. An international team of researchers, lead by the Environment Institute’s Bayden Russell and Sean Connell, has done just that. Their findings, published this month, outline the necessary steps to improve our understanding of the how climate change may degrade marine ecosystems and what (if any) actions we may be able to take to ameliorate these impacts. 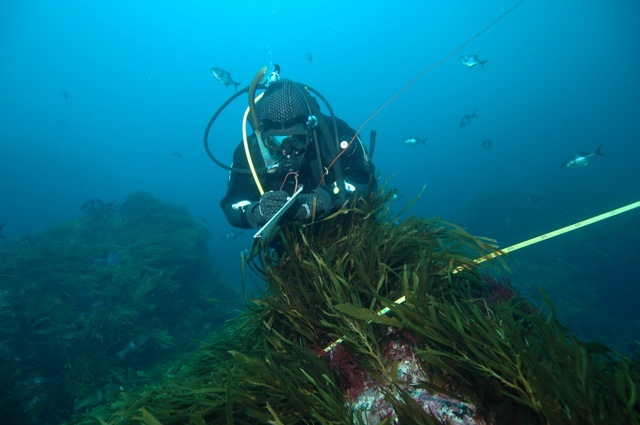 Using kelp forests in South Australia as a case-study, they further highlight the necessity of targeting species which maintain ecosystem functioning in future research into the impacts of climate change. To read the full journal, click here. This entry was posted in News, Publications and tagged Bayden Russell, Climate Change, Sean Connell. Bookmark the permalink.